Home > Design > What is Cross Laminated Timber (CLT)? 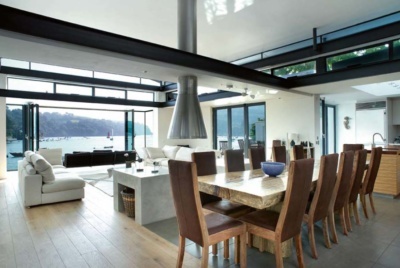 Cross laminated timber, commonly known as CLT or crosslam, is a precision engineered building material that, despite a raft of practical and ecological benefits, is yet to be widely adopted by the UK self build market. Growth has, however, been strong in the commercial sector, and it is likely that you have seen a building that features CLT: many modern schools, supermarkets, galleries and residential blocks use CLT for the superstructure. While residential take up has been slow, there have been a number of award-winning self-builds in the UK featuring CLT — including Adam Knibb Architects’ Hurdle House, which won Best Contemporary Renovation/Extension in The Daily Telegraph Homebuilding & Renovating Awards 2017, and the RIBA Award-winning Strange House. Where Does CLT Come From? The idea of stacking timber planks (known as lamellas) together to create a construction system can be traced back to German engineer Julius Natterer. He developed a system known as Brettstapel, which originally used nails to secure the wood in place (and now uses wooden dowels). This is still widely used in Austria and Germany and can be seen as a precursor to CLT, which developed out of academic and industrial efforts in the 1990s. CLT differs from Brettstapel in that it uses high grade timber stacked in a cross pattern to provide structural strength across two axis, rather than stacking in a single direction. CLT is formed of kiln-dried spruce or pine boards which are laid on top of each other at 90° (three, five, seven or nine layers depending on structural requirements), coated with a layer of polyurethane adhesive and subjected to immense hydraulic pressure to create large, stiff, dimensionally stable panels. These timber panels, which can measure up to 3.5m in width and 20m in length, depending on specification, can be used to create the complete superstructure of a building. CLT panels are precision cut by CNC machines (from 3D CAD drawings) and delivered to site to be installed by specialist CLT installers. Tigh Beag is situated in the Scottish Highlands and is a new build house featuring CLT. Window and door openings are created during manufacture to such high degrees of accuracy that glazing can be ordered from the initial drawings. The high tolerances involved greatly improve airtightness and thermal performance and mean that CLT can be used in Passivhaus designs. Currently, the majority of CLT is manufactured in Austria. Major players include Binderholz, KLH, Stora Enso and Mayr-Melnhof, with European production volume estimated to be around 610,000m3 in 2015, a figure that is growing year-on-year. There are currently no CLT manufacturers in the UK, which means all CLT builds here will import directly from Europe, though many of the key CLT producers work, own or partner with UK-based CLT installers who provide services such as consultation, design, supply and installation. Non-visual CLT is designed to be plasterboarded over, and industrial and high-grade visual are intended to be left exposed — typically the former for exposed soffits and the latter for walls. Visual grade CLT is made from a higher grade of timber which is planed, sanded and dried to a lower moisture content to ensure less movement and cracking in the future and with wider lamellas to reduce the number of boards on a visual surface. Leaving the timber exposed on the internal face is one of the key design advantages of CLT, giving a striking contemporary timber interior. 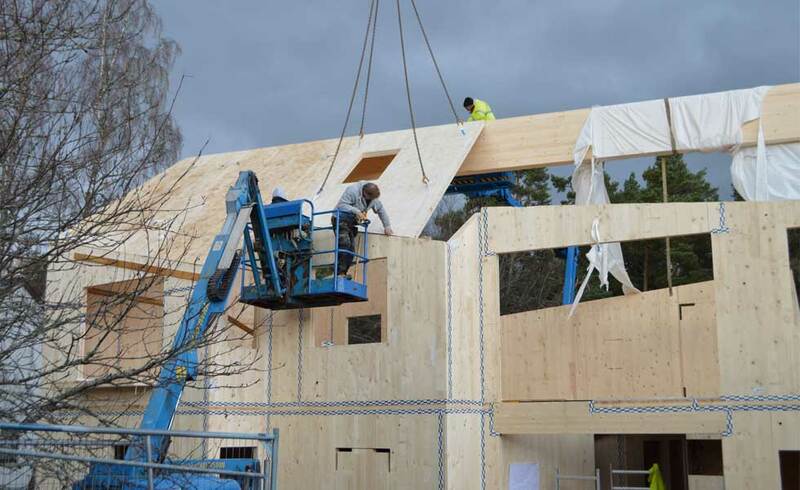 Once the CLT panels are delivered to site they can be installed quickly — for example, Stora Enso estimates that a detached three bedroom house can be constructed in five to eight days. As getting wind and watertight is usually one of the key milestones for mortgage payments, you could also see your mortgage stage payment releases arrive sooner. Like any building project you want to get the design right and frozen before you break ground. Making changes to drawings is far easier and cheaper than making changes on site. However, if the alterations are carefully considered and your design team is consulted, then changes are possible with CLT. As each wall has an associated drawing, it can often be easier to complete a change to a prefabricated building than a traditional site-built home. You won’t need any proprietary cladding either — a CLT build can be clad with the same external materials as any other build method. As most CLT residential buildings will be wrapped in insulation (up to 200mm depending on the desired U value), this needs to be considered when choosing the fixing method for the cladding. The most efficient systems to install are rainscreen cladding or lightweight cladding systems (smooth render, cementitious boards or stone slips, for example), which can be fixed directly into the CLT via fixing clips or battens. But there’s no reason why traditional brickwork cannot be used. Remember too that after the CLT superstructure has been installed you will need to employ another trade or company to fit external insulation. As with any off-site manufacturing method, you will need to ensure that there is access for an artic lorry and mobile crane to allow the panels to be delivered and craned into place. It is also worth considering the transport costs when designing with CLT — an average small house would use 40-50m3 of CLT, which equates to one full truck-load. How Much Does CLT Cost? 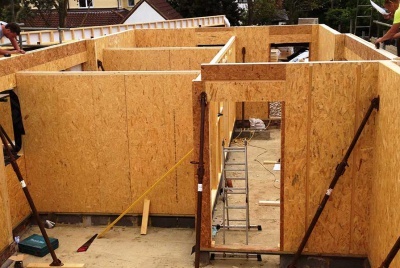 It’s difficult to provide an accurate estimate for a CLT build here – a lot depends on the design – but expect to pay between £350-£500/m2 of gross internal floor area for a CLT-built house. Don’t forget, the upfront costs may appear high, but you will make savings through the speed of the build compared to some other build methods. CLT companies will be able to provide an estimate, which will usually take between two to six weeks (and can be done from your drawings). This figure will be for the supply, design and installation of the CLT structural frame and not the whole house. Without a UK-based CLT manufacturing facility it is unlikely that prices will change dramatically in the near future. 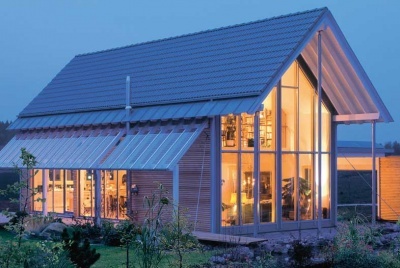 Napier University’s Centre for Offsite Construction + Innovative Structures examined the viability of manufacturing CLT from UK resources and found that it could be a viable proposition using sitka spruce (which accounts for around 50% of the UK’s softwood resource). But there were challenges, including that the UK’s spruce performed differently to the softwoods on the continent under structural testing and would need to be kiln-dried to a lower moisture content than current UK standards to match European CLT’s material properties. CLT is currently a seemingly underexposed option for creating highly efficient, design-led and structurally stable homes that can benefit from reduced foundation costs compared to a traditional brick and block build, reduced construction time and a safer construction environment when compared to some other build methods. 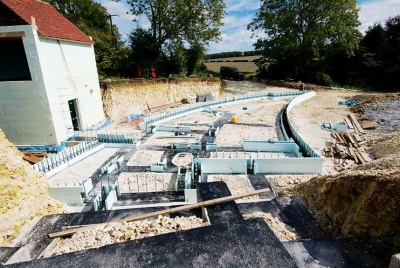 Off-Site Kit Houses: A Greener Build?